We've been covering the October Revolution and its aftermath with uncharacteristic nuance. On November 7, 1917, the first workers’ state was born out of a popular uprising. For a long century, socialists have looked back at the October Revolution — sometimes with rose-colored glasses, sometimes to play at simplistic counterfactual. But sometimes for good reason. After all, exploitation and inequality are still alive and well amid plenty. Even knowing how their story ended, we can learn from those who dared to fight for something better. Take a look below at our recent series on the Russian Revolution, which includes China Miéville, Alexander Rabinowitch, and others. So far entries have been translated into Chinese, Dutch, Farsi, French, German, Greek, Italian, Korean, Kurdish, Portuguese, Spanish and, of course, Russian. 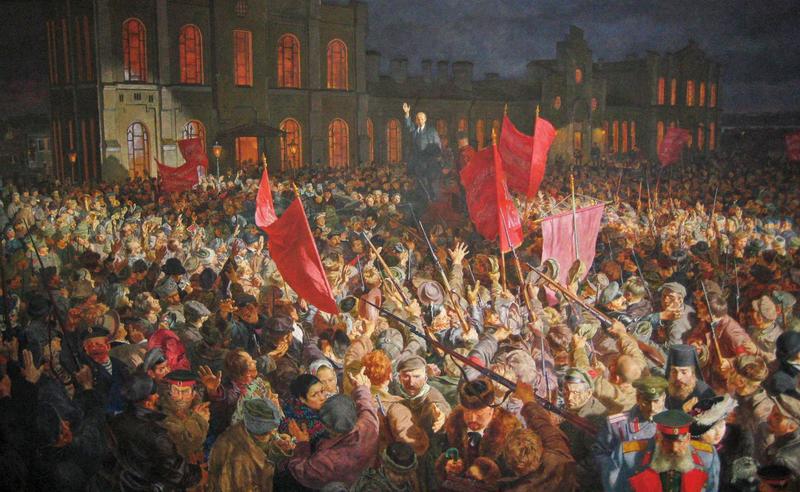 The February Revolution erupted 100 years ago and swept away a blood-soaked monarchy. In the standard account, February was the good revolution and October was the extremist one. But events in Russia were far more complex than that. The forgotten Finnish Revolution has perhaps more lessons for us today than events in 1917 Russia. Women weren’t just the Russian Revolution’s spark, but the motor that drove it forward. The revolutionary violence of 1917 paled in comparison to that on the fronts of the Great War. The Bolsheviks wanted to avoid the Paris Commune’s fate. That’s why they didn’t take power in July 1917. In Russia 1917, ordinary rural people took direct action to remake their world. The October Revolution was propelled by mass dissatisfaction with the erosion of February’s gains. One hundred years ago, why did the alliance between General Lavr Kornilov and Alexander Kerensky fall apart? The story of the Baku Commune’s leaders, who pursued power democratically and nonviolently, belies many of the myths of the Russian Revolution. The Bolsheviks’ rise to power, one hundred years ago today, revisited. The story of November 7, 1917 — the day the Bolsheviks changed world history. Forthcoming series authors include Suzi Weissman, Soma Marik, and Neil Davidson.